My daughter chose the fabrics she wanted to use from my scrap box. 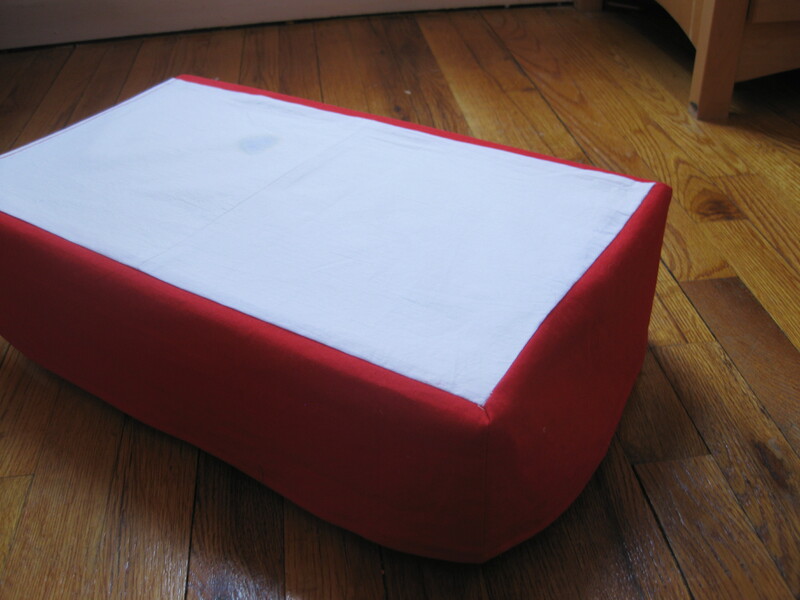 To make the bed skirt, I attached three panels of red cotton/linen to a rectangle of muslin in a simple box shape. I made a mattress out of plain white cotton with cotton batting. Same for the pillow, but I tore up the batting to make it more fluffy. Then, my daughter, who was given an embroidery kit from my granny, embroidered the pillow case–all by herself! Finally, the quilt was really quick to make. My daughter wanted one fabric for the top, so I pieced together a few scraps to make a rectangle, and then used white for the backing. Rather than binding the quilt, I sewed regular seams and just turned it inside out. I also tried quilter’s knots to quilt the layers together, for the first time. All around, we’re pretty pleased with how this turned out–without spending a penny! Have you made anything for American Girls? We’d love to hear about your excuses to play with your kids’ toys! I admire little B’s handiwork on the pillow. Did you close up the pillow, or just leave the stuffing open? Is the pillow also muslin or white cotton? And btw, what is Kona cotton, which I noticed you mentioned in your last post? So many Qs . . . I closed the pillow up. I just top stitched, rather than doing an invisible stitch. Then, I made a pillow case with an open end using the fabric little B embroidered. Kona cotton is just a brand–well not “just.” The maker is Robert Kaufman, and it comes in almost any color you can imagine.